It appears two of my favourite Beasts of Brewdom will be descending on the World Tea Expo in Vegas, and I simply wanted to raise my cup to them both. Here’s to you, Geoff. And Robert? I suppose here’s to you, as well. This cup of green I’m enjoying in your honour? It’s not particularly refined. It’s even got a bit of a kick. The rough around the edges nature of this tea seems to fit perfectly with my toast. Hope you have a great time together, and I look forward to when the three of us are simultaneously in the same place. Wishful thinking, eh? For the last several years, I’ve worked with a friend who showed an uncommon interest in tea. Well, uncommon in relation to my other colleagues. He’s recently decided to relocate to Australia, and I knew the perfect tea to toast his safe flight and smooth transition. That’s right: a cuppa Daintree. What could be more perfect? He’s read my blog, shared a flask of tea at the end of a long dog walk, and even taken part in some Gong Fu brewing. He’s always been very polite, even when the tea was not what he expected. And more often than not, he was appreciative to try new tea. Something about a Choice Formosa Oolong seemed to always put a twinkle in his eye. So, here’s us raising out mugs to future success and global friendships. Who knows, maybe he’ll even come to Tea Trade and join in the discussion. He’d be a welcome voice here. Found an article in the paper and this seemed like the ideal place to share it. As a cautionary tale, I assure you. In order to hide the murder, a Pakistani woman dismembered and then cooked her husband’s body parts in order to hide the evidence. He’d allegedly been making advances on her 17-year-old daughter (from another marriage) and when she’d had enough, she killed him. Well, she drugged his tea of course. What else? So, what’re we to learn from this? Firstly, do not try to have relations with your step-daughter(s). Unless you’re Woody Allen and she was adopted, anyway. Then it’s ok. Sort of. Actually, it’s not really ok, but Mia Farrow didn’t have the right tea for drugging and then dismembering him. If you ladies want to discuss the right tea for drugging your horndog of a man, you’ll have to start your own lady tea blog. We’re not going to cook our own proverbial goose. Not here anyway. Back to the moral of this story. If you gents are, for whatever reason, participating in clandestine activities with members of your family that may or may not be related to you by blood, just don’t drink any tea you’re offered. To stay on the safe side. what tea do I start with? What a weekend. Think you’ll enjoy the recap of the highpoint. Was asked by a friend today what the ‘best tea’ was. What a question, eh? But I love a good debate. And blog comments. In case I’ve been unclear in the past, I really really like blog comments. So here’s my not-so-humble answer. I wonder how the rest of you might respond. 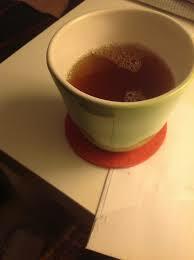 Many teabloggers focus on green and/or Oolong tea, but as much as I like them, I’ve focused more on black tea. Most tea sellers in Germany make their own unique Ostfriesen Blend that is often a mix of strong, malty Assam and a Chinese Keemun (and maybe an Indian Nilgiri). If I had to choose my favourite non-single estate tea, it’d be one of those specialty blends. But if it’s brands we’re talking about, the tastiest and most consistent tea I’ve found is ‘Yorkshire Gold’ made by Taylors of Harrogate. But that’s only if we’re talking about black tea blends. I’d say the best non-green/Oolong tea, in my opinion, is still a single estate Darjeeling (to be truly accurate, most ‘black’ Darjeeling is really only 90% oxidised, so it’s actuallyOolong). I like stronger tea, so I enjoy second as well as first flush Darjeeling. But the best brand? If you’re buying from a seller that can tell you on which estate aDarjeeling was grown, then the likelihood is that it’ll be better than something labeled simply as ‘Darjeeling’. The estimation is that 40,000 tonnes of Darjeeling are sold worldwide, while only 10,000 tonnes are grown. Logically, one isn’t always entirely sure that purchased Darjeeling was actually grown there. Again, I’m very grateful for the question. Clearly the answer you’ll get is entirely objective. I like thinking about how to make loose-leaf tea drinking more attractive. If I were a tea snob, it’d be the worst way of going about the whole thing. What about you other tea obsessives? When someone asks you what the ‘best tea’ is, what might you say? I know on the face of it, it’s an impossible question. But please jump in and claim your stake on this issue. Did I mention that blog comments are encouraged? There’s probably a better way to link to it, but Beasts sometimes take a bit longer to figure things out.